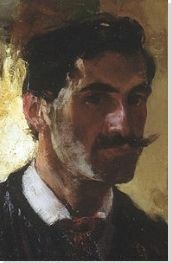 The son of a prominent lithographer for the print firm of Currier & Ives, Alfred Maurer began his career in a conventional manner; he attended the prestigious National Academy of Design in New York, finding success with a realist style akin to James McNeill Whistler, before moving to Paris in 1897. There, he became part of the expatriate circle of American artists in Montparnasse and his paintings were well received in both Paris and New York as part of the circle of artists around Robert Henri. Yet, in 1906, Maurer abandoned this style to become one of the first Americans to adopt a riotous Fauve palette and "primitive" forms. Familiar with Paul Cézanne's work and other avant-garde French painters from the salons of Gertrude and Leo Stein, he incorporated their brilliant colors and bold distortions into his work. His balance between abstraction and representation pioneered new terrain for his American audience. At the outbreak of WWI, Maurer was forced to leave Paris and in the post-war years, the obvious influence of French modernism on his work conflicted with the growing nationalism of American art. Although his "howlers in color" were enthusiastically received by artists and the avant-garde (who continued to believe their forceful palette and energy blazed new artistic ground) Maurer struggled for mainstream recognition and sales. Maurer's artistic endeavors were compounded by the disapproval of his more traditional father; the reasons for the artist's suicide, which followed the death of his father by mere weeks, have been the subject of much speculation. Embracing the bold palette of Fauvism and the abstracted forms of early Cubism, Maurer explored the potential for the expression of subjective emotions through representational forms. His understood his abstractions as manifestations of another level of reality and introduced these ideas to the avant-garde in New York, especially the circle around Alfred Stieglitz that included John Marin, Marsden Hartley, Georgia O'Keeffe, and Arthur Dove. He believed that art had to convey a sense of experience, not just an observed subject. While Maurer abstracted his subjects in order to evoke emotional experiences for his viewer, his decisions about color and shape were also appreciated for their simultaneous sense of balance and energy. Later generations of abstractionists, who did not subscribe to his metaphysical beliefs about painting, still looked to his example of powerful color harmonies and dynamic forms. His experiments created a foundation for Abstract Expressionism and other expressionist styles of painting. Moving away from his Fauve roots, Maurer's postwar figurative paintings were part of an international return to order and the development of a modern version of classicism. His realism provided an alternative to Regionalist painting, keeping a strain of American modernism that connected back to European art and tradition. His highly-simplified, icon-like paintings of women recast traditions of art history in a modernist palette with bold brushwork that flattens three-dimensional space. Painted in a style heavily influenced by Whistler, this work was a critical success for Maurer, winning the gold medal at the juried Carnegie International exhibition in 1901. Even the title reflects the influence of Whistler and the Aesthetic movement, as it suggests a musical composition and the close tonality of a subdued palette. The subject of the painting, a young woman set in a fashionable japoniste background, is less important than the abstract quality of the loose brushwork and harmonious shades of brown, gray, and black. The effect is a meditative mood that is created by the painterly qualities of line and color. With bold compositions such as this, Maurer quickly became the most famous American Fauve artist, incorporating the bold colors, abstract forms, and flat space of that style. Rather than using color descriptively, he now embraced its suggestive and emotional potential, using unnatural tones to create a sense of energy or mood. He believed this mode of abstraction conveyed the true essence of his subject. Here, he skillfully balances the bold, gem-like, shades of blues, greens, reds, and yellows, to create flat planes of color that both describe the subject and create a flattened, decorative design. Sending his work back to America for exhibitions, he was an important influence, spreading the theories of Fauvism and the potential for abstract art to artists and audiences in the States. Around 1919, Maurer began two series, Girls and Heads, to which he would return until the end of his life. He adopted a relatively standard format, positioning his sitters alone or in small groups, most often in a simple frontal pose and three-quarter length. The series progresses from fairly representational and naturalistic depictions to more stylized and abstractions renderings. Although they tend to have generic features, they were based on models. Influenced by a general return-to-order in the postwar years, these paintings convey classicism in both their traditional subject and their calm approach to figuration. They reconnect to the realist paintings that had originally established Maurer's reputation, but break from his earlier illusionism to incorporate a range of primitive, Renaissance, and modernist influences. Critics considered them as "modern madonnas" and noted their Byzantine elongations of the female body; their deliberate awkwardness was celebrated as a powerful interpretation of non-Western masks and carvings.